The VM-3UHD is a 4K UHD 1:3 distributor for HDMI signals. 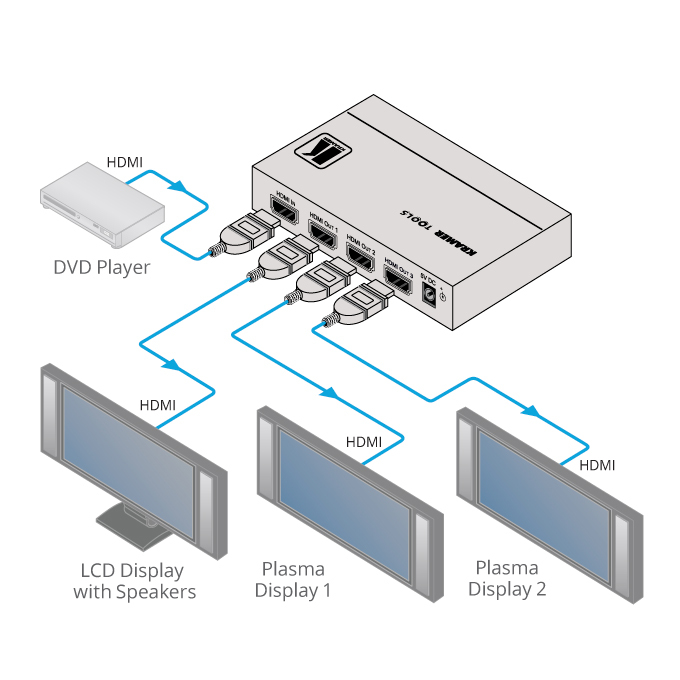 It takes one HDMI input, equalizes and reclocks the signal and distributes it to three identical outputs. The VM-3UHD distributes signals having resolutions up to 4K@60 UHD (4:2:0), WUXGA and 1080p. Resolution Support - Up to WUXGA, 1080p, 4K@60 UHD (4:2:0). HDMI Support - Deep Color, x.v.Color, Lip Sync, HDMI Uncompressed Audio Channels, Dolby TrueHD, DTS-HD, CEC. Kramer Equalization & re-Klocking Technology - Rebuilds the digital signal integrity to travel longer distances. I-EDIDPro Kramer Intelligent EDID Processing - An intelligent EDID handling and processing algorithm that ensures Plug and Play operation for HDMI systems. USB Port - For firmware upgrading.